Harkening back to “The Locomotion,” “The Time Warp,” and the “Cha-Cha Slide,” Silentó’s “Watch Me (Whip/Nae Nae)” is the latest in a long line of songs that describe exactly how to dance to them. The moves demanded of Silentó’s hit include not only the “Whip” and the “Nae Nae,” but also “Stanky Leg,” the “Break Your Legs,” and the “Bop.” And while that might sound overwhelming to those not down with youth culture, one iconic cartoon character is bridging the generation gap. 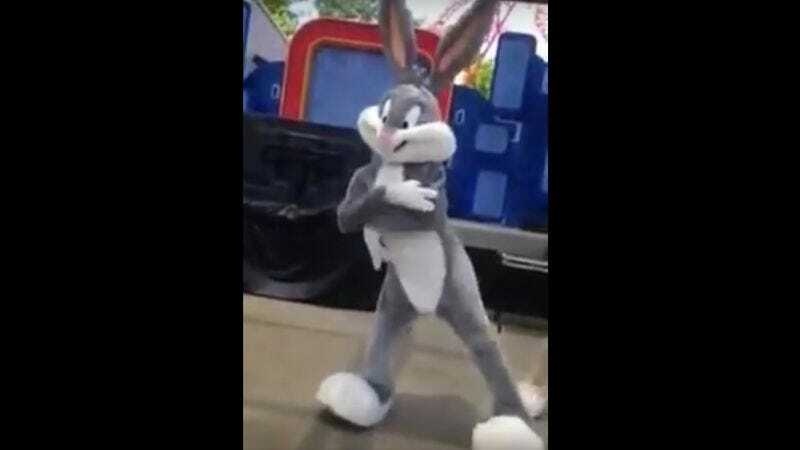 In a video that’s been making the rounds lately, a costumed Bugs Bunny “murders” the dance at what looks to be a Six Flags show. While the rest of the Looney Tunes try their best (and Daffy turns in a nice Stanky Leg), Bugs Bunny is clearly leagues above his cartoon brethren when it comes to performing the moves with a certain je ne sais quoi. In fact he’s so good it’s best not to think about the fact that he’s probably inhabited by a frustrated dancer who only took this job because he just can’t face one more rejection from the Martha Graham Dance Company, damn it.